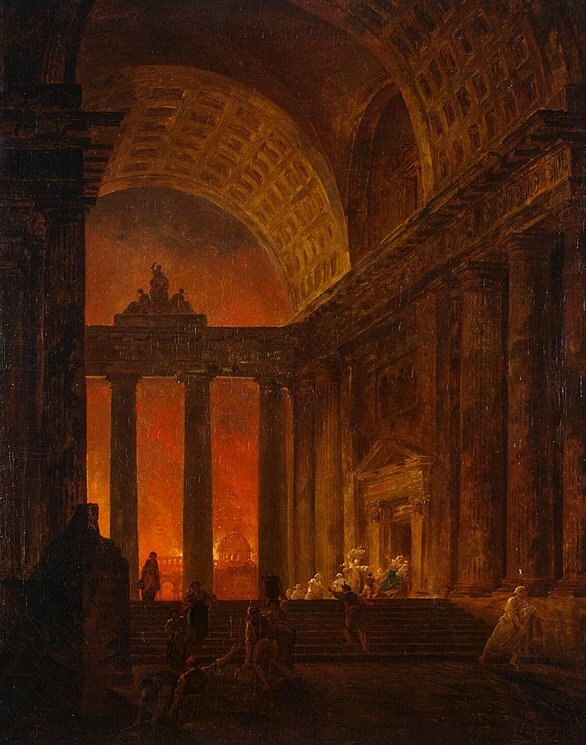 A devastating fire breaks out in Rome in 64 AD. According to the historian Tacitus, people suspect Nero of being the arsonist. To shift the blame, he makes the Christians scapegoats and begins the first persecution. The Christians are interrogated, crucified, burned and fed to the dogs. 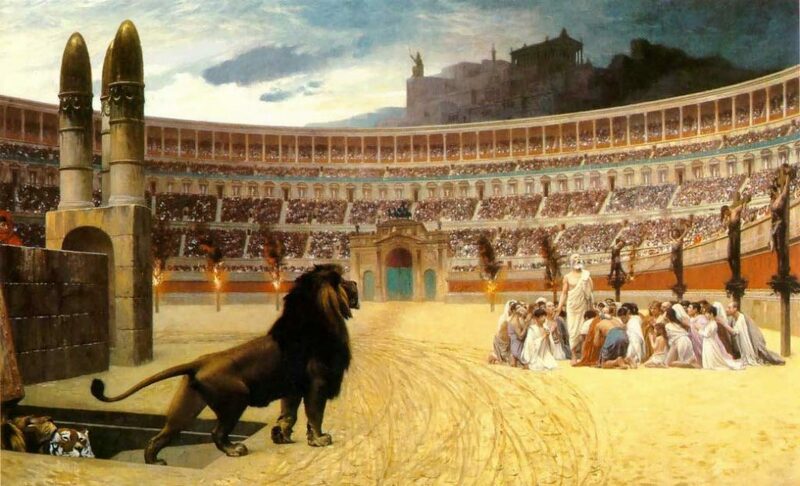 In 177 during the reign of Marcus Aurelius, a local persecution of Christians erupts in Lugdunum or present day Lyon. The Christian historian Eusebius (263-339) later passes on a first hand account of the persecution. The emperor Decius initiates the first general persecution of Christians in 250, in an attempt to win back the gods and stop an Imperial crisis. All subjects are ordered to sacrifice to the old gods on pain of death, and obtain a certificate. This certificate survives from Oxyrhynchus, Egypt. The emperor Diocletian launches ‘The Great Persecution’ in the winter of 303. Edicts prohibit Christians from meeting and Bibles are burnt in public. Next year, all subjects are ordered to sacrifice on pain of death. According to estimates of modern historians, between 2,500 and 3,500 are killed in the persecution. The emperor Galerius puts a stop to the Christian persecutions in 311 by issuing the Edict of Toleration. Two years later, his successor Constantin declares freedom of religion with his Edict of Milan. Read both edicts here. 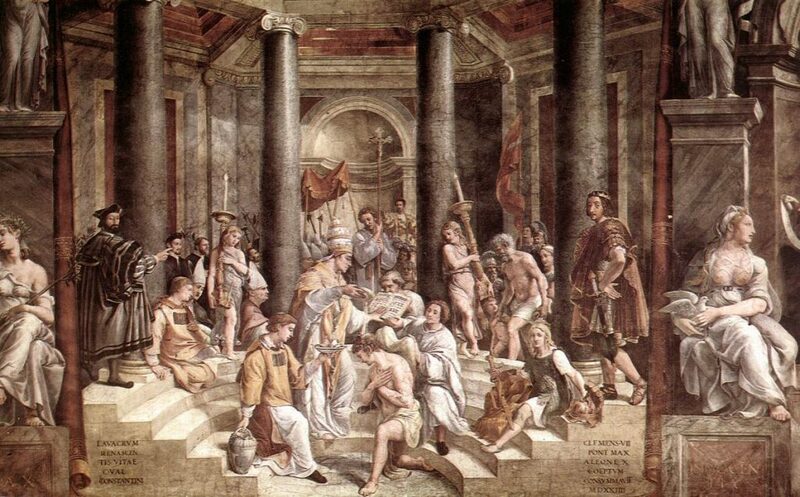 Constantin becomes the first Christian emperor of Rome when he is baptised on his deathbed in 337. With the support of Theodosius, the bishop Theophilus and his supporters attack the Serapeum – a daughter library to the Great Library of Alexandria – in 391. The temple is destroyed with more than 40,000 books. 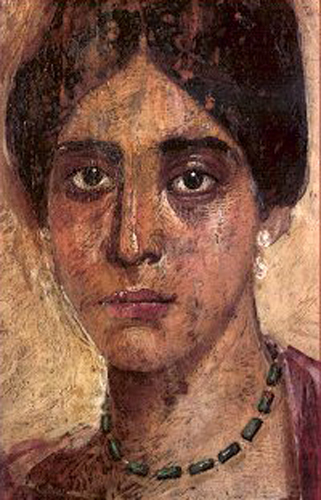 During Lent of 415, a Christian mob attacks the Alexandrian philosopher and mathematician Hypatia. The Christians drag her through the streets to a local church. According to one account, they strip her naked and use broken tiles to cut the flesh off her body. Her mutilated remains are paraded through the city. Read accounts of the murder here. 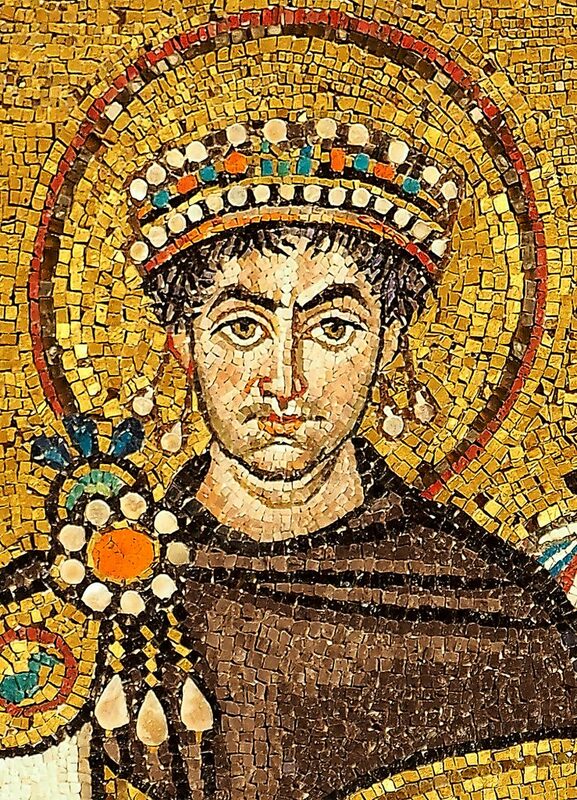 Justinian I (r. 527-565) rules his empire according to the motto “One empire, one faith, one church”. In 529, he closes the ‘pagan’ Neoplatonic Academy in Athens. In 529 and 531, he bans all heretics – including pagans and non-orthodox Christians – from becoming teachers. In 539 he introduces the death penalty for blasphemy, lest “God in his wrath may destroy the cities and their inhabitants”. 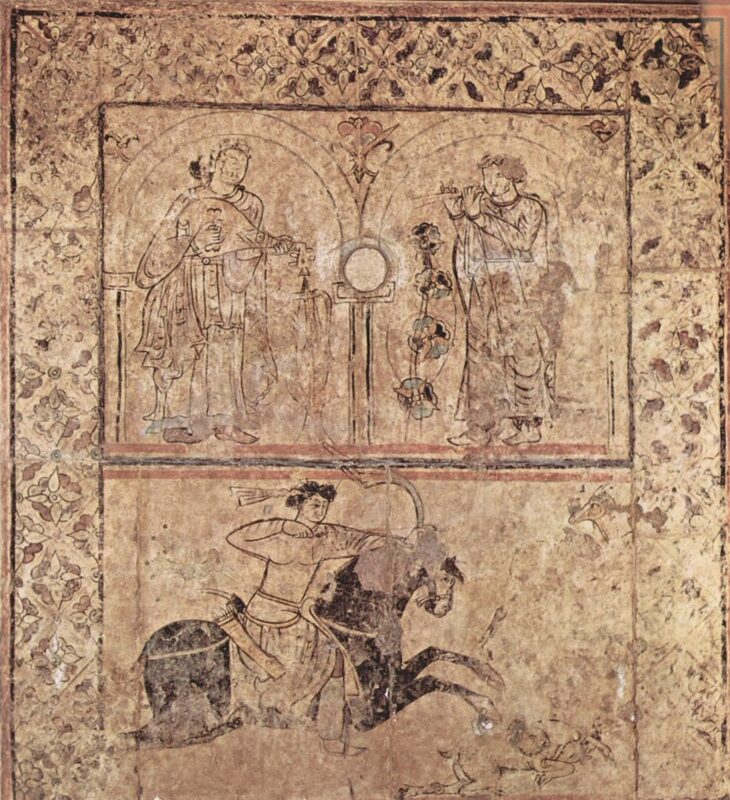 And why are developments in the 11th century crucial to understanding modern controversies over blasphemy and apostasy, such as the Salman Rushdie affair and the attack on Charlie Hebdo? Find out in episode V of “Clear and Present Danger: A History of Free Speech”. Muhammad (c. 570-632) is the founder of Islam and proclaimer of the Qur’ān. According to Islamic tradition, he receives his first revelations in the 610’s. With his followers, he conquers much of the Arabian Peninsula until he dies in Medina in 632. After his death, the First Caliphate conquers the Middle East and North Africa at break neck speed. Within thirty years, the Caliphate stretches from Gibraltar to Persia. The Umayyad dynasty rules the Caliphate from their capital in Damascus between 661 and 750. They extent the Caliphate as far as the Indus river. Around 684, Caliph ʿAbd al-Malik makes one of the first attempts to purge the Caliphate from heresy. The believe in free will instead of predetermination is especially problematic, as it undermindes the legitimacy of the caliphs A heretic is crucified around 699. In 724, the new caliph HishāmʿAbd al-Malik executes Dirham, a religious scholar, for heresy. The ‘Abbāsid Dynasty rules the Caliphate from their capital in Baghdad for five centuries. The Dynasty initiates what is known as ‘The Islamic Golden Age’: A time of great social, scientific and philosophical progress. 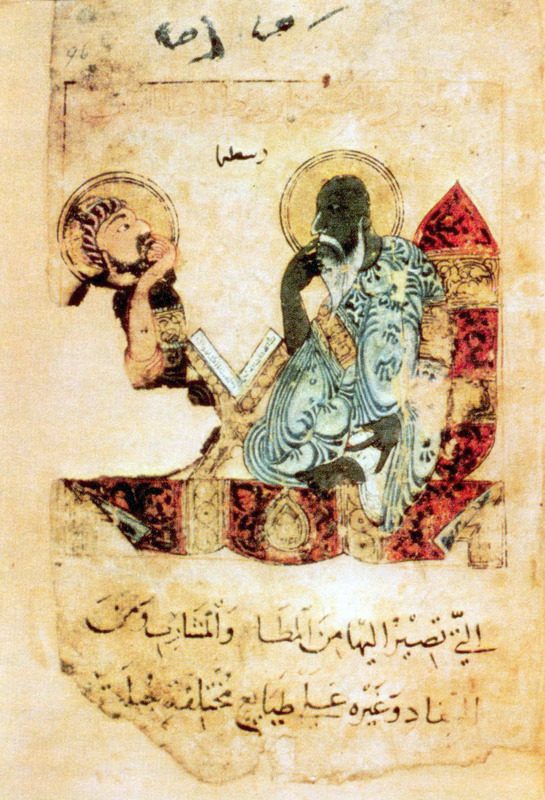 The Graeco-Arabic translation movement is launched by Caliph Al-Mansur in 754. 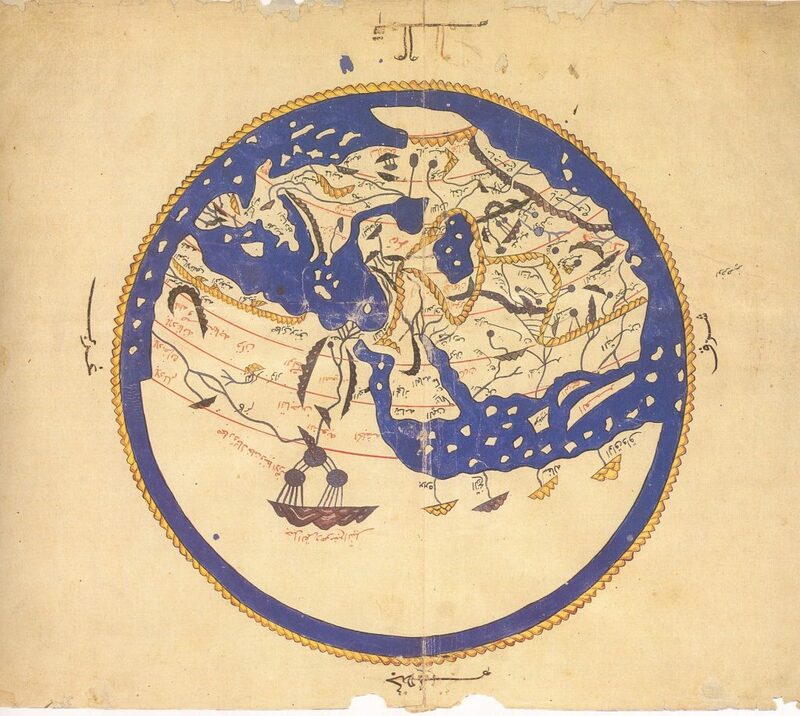 In the following centuries, Aristotle, Plato, Ptolemy, Euclid, Galen and Hippocrates are all translated into Arabic. In the 12th and 13th centuries, the ancient thinkers are translated from Arabic into Latin so their ideas can seep into the European university. In 833, the ʿAbbāsid Caliph Al-Mam’un institutes an inquisition known as the Minha. It revolves around the issue of the origin of the Qurʾān: Was the Muslim Holy Book created or is it the uncreated work of God? Religious scholars out of line are forced to recant or risk imprisonment, flogging and even execution. 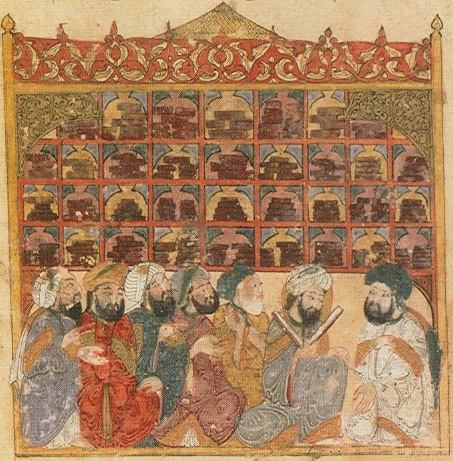 Caliph al-Mutawakkil abolishes the Minha in 848 when he endorces a traditionalist doctrine of uncreatedness. Translators who’re seen as “too rationalistic” are imprisoned. 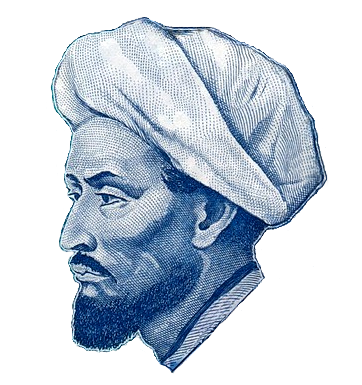 Ibn Al-Rawandi of Khorasan in present day Afghanistan is one of the earliest Islamic sceptics. None of his 114 books have survived, but he is often cited by his many critics in their furious refutations. During his lifetime, Al-Rawandi jumps from Mutazilite to Shīʿite to radical scepticism bordering on atheism. Disguised in the voices of Indian Brahmins, his works reject miracles, attack the Qurʾān as an absurd book full of inconsistencies and holds that prophets are unnecessary and fraudulent. Even the prophet! 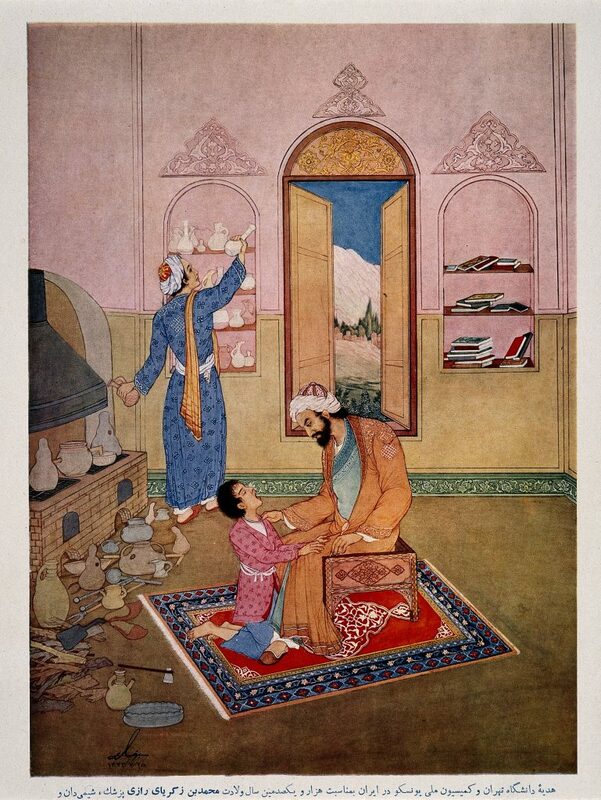 The nearly 200 books of Persian multi talent Abū Bakr Muhammad ibn Zakariyyā al-Rāzī – also known as ‘Rhazes’ – span everything from medicine and chemistry to logic and philosophy. He supposedly goes blind from all the reading and writing. His greatest achievements include the discovery of alcohol and a groundbreaking thesis on measles and smallpox. Abu Nasr al-Farabi excels in two areas. As a philosopher and logician he is known as “the second master”, only surpassed by Aristotle. As a musicologist, his Kitâb al-musiqâ al-kabîr or Great Book of Music is the most influential work on music from the Islamic Middle Ages. 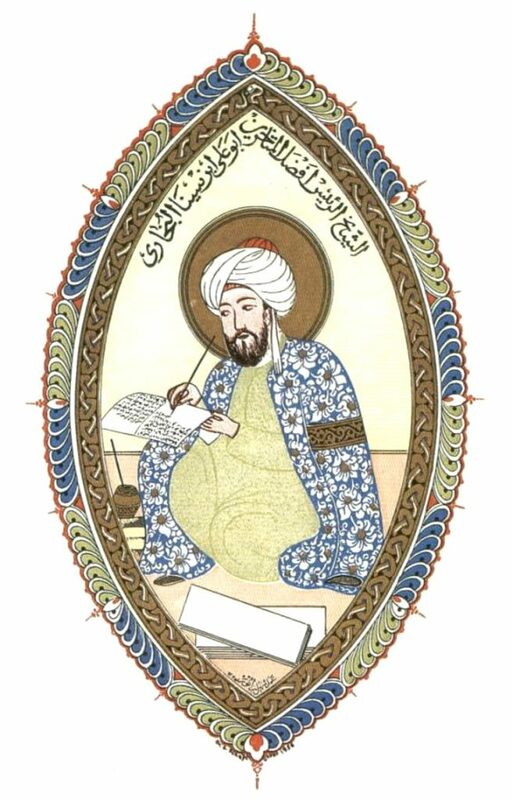 No figure from the Islamic Golden Age towers above Ibn Sina. To most Westeners he is better known as Avicenna. His achievements in philosophy and medicine not only shape Islamic but also European thinking for centuries. When works like his Canon of Medicine are translated into Latin, they become core curriculum in most European universities. In The Incoherence of the Philosophers, the influential philosopher and theologian al-Ghazali launches an attack on Aristotilean thinkers like Ibn Sina and al-Farabi. Al-Ghazali is often depicted as a strict opponent to reason, but modern scholars think he has been misinterpreted.